With the departure of Albert Pujols and Prince Fielder from the National League Central, fans are probably wondering who will be the team to emerge for the pennant next year. The St. Louis Cardinals aren’t automatic favorites anymore with Pujols not in the picture. 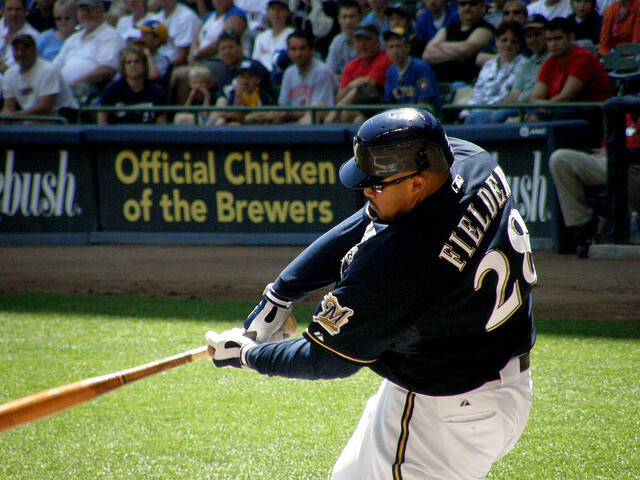 And the magic will have probably left Milwaukee — along with Fielder — when the final months of the 2012 season unfold. There’s no doubt the N.L. West will never be the same. But don’t be discouraged. The largest division in baseball should still create some late-season drama. The Cards and the Brew Crew did lose some big bats, but have bright stars in the waiting. And don’t count out the Chicago Cubs or the Cincinnati Reds, either. As usual, those four teams should be in a dead heat toward the end of the season for the division crown. Each club definitely has a shot and the division should be as competitive as ever. During the last handful of years, as a fan of the Anaheim Angels (yes get that Los Angeles Angels of Anaheim crap out of here), the hot stove portion of the MLB offseason hasn’t been kind to my beloved team. After all, I’ve seen Chone Figgins, John Lackey, Mark Teixeira and Vladimir Guerrero walk for a variety of reasons and seen my Angels squander opportunities to sign the likes of C.C. Sabathia, Carl Crawford and Adrian Beltre. All of this despite constant claims from owner Arte Moreno about being ready to open up his checkbook. Granted last offseason’s marquee free agent acquisitions, Scott Downs and Hisanori Takahashi, were vital components to the Angels’ bullpen in 2011, they weren’t exactly the big signings us Angel faithful were clamoring for. Add in poor trades by former general manager Tony Reagins for the likes of Scott Kazmir and the Vernon Wells deal, and there’s a plethora of reasons why Angels fans were chomping at the bit for off season excitement. That’s why I approached this winter with cautious optimism. Who could blame me? I knew where the weaknesses laid within the roster, namely at the back end of the starting rotation and at the hot corner. However, with a combination of a relatively weak free agent crop and a team payroll cash-strapped due to the albatross that is Vernon Wells’ contract, what could I really expect? Then came the morning of December 9. That’s the morning that Moreno described as a “monumental day for Angel fans.” That’s the morning that Moreno and new general manager Jerry Dipoto brought Albert Pujols to Southern California. That’s the morning the Angels franchise, regardless of what you want to call them, changed forever. Granted Pujols didn’t fix one of the aforementioned weaknesses on the roster, but how often do you get a chance to add a three-time MVP who only once in his 11-year career failed to knock in 100 runs and hit better than .300? For the record, he missed those marks this past season by batting .299 with 99 RBIs. This is a guy who’s won two World Series and is already in the conversation of becoming one of the greatest players of all-time up there with Ruth, Williams, Gehrig, you name it. Is Fielder headed to the Nats? Only one big name still stands after players like Albert Pujols, Jose Reyes and C.J. Wilson were plucked off the Major League Baseball free agent market for big bucks. And that big name comes with perhaps the biggest body and burliest beards in baseball. Yes, for some reason, Prince Fielder hasn’t found a team yet — despite easily being the second-best hitter on the market this winter. There’s been rumors about the Chicago Cubs, Seattle Mariners and even the Texas Rangers trying to woo the 275-pound first baseman. But this week the Washington Nationals, an unusual suitor, came out as the top team in pursuit of Fielder. So why did it take so long for one squad to step up as frontrunners for a 30-year-old who hit .299 with 38 home runs and 120 RBIs last season? Probably because Fielder’s agent is the dubious Scott Boras. It also likely had something to do with the amount of zeros in Pujols’ ground-breaking contract. And if you’re a team dealing with those two factors, deals aren’t going to happen fast. Boras has made things tough by changing his mind at least a handful of times, trying to get what’s best for Fielder. At first, the pair thought it would be an Pujols-like deal. Interested teams didn’t. Then, the duo wanted a deal slightly less than Pujols’ hefty $240 million, 10-year contract — so somewhere in the $200 million range. Clubs also didn’t see eye-to-eye on that idea. So Boras thought Fielder could land a shorter contract, but still make the big bucks. That’s about where prospective negotiations are at now, but the asking price for Prince may still be too high, for some teams. In the premiere of the sports podcast, Couch Side, hosts Wade McMillin and Jordan Wheeler explore NFL playoff hopes for teams in the tightest divisions; debate if players are still loyal in the NBA; and react to Albert Pujols’ monster contract. Click below to beginning listening to Couch Side.